Party games offer a fun and exciting way to engage guests and get them interested in purchasing the products you sell. Try incorporating a couple of these games into your home party presentations, and see if they increase your sales, as well as your future bookings. Product demonstrations are useful, but your guests are eventually going to get bored unless you give them something fun to do. The following games work well for a variety of home sales parties. Play this game at any type of apparel or accessories party. Your guests will need paper and pencils to write down their answers. At the beginning of the party, have the hostess walk around and mingle with the guests. Be sure she is wearing several items of the brand you are demonstrating. After the guests are settled in and the party festivities are about to begin, have the hostess leave the room. Ask each guest to write out as many details as possible about the hostess, including what she is wearing, how her hair is styled, which pieces of jewelry she has on, etc. Whoever gives the most correct answers will win a small prize. After the game ends, be sure to point out the pieces of jewelry, clothing or other accessories that the hostess is wearing, and explain to the guests that they can order these items from you during the party. Click to print What's in Your Bag? 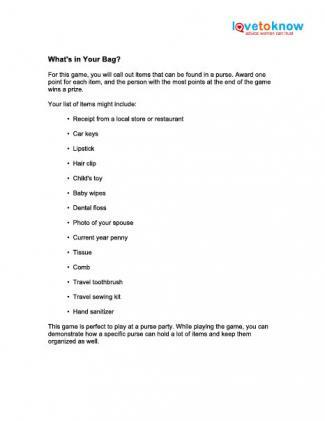 For this game, you will call out items that can be found in a purse. Award one point for each item, and the person with the most points at the end of the game wins a prize. This game is perfect to play at a purse party. While playing the game, you can demonstrate how a specific purse can hold a lot of items and keep them organized as well. 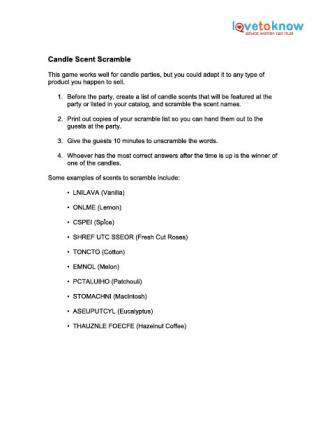 This game works well for candle parties, but you could adapt it to any type of product you happen to sell. Before the party, create a list of candle scents that will be featured at the party or listed in your catalog, and scramble the scent names. Print out copies of your scramble list so you can hand them out to the guests at the party. Give the guests 10 minutes to unscramble the words. Whoever has the most correct answers after the time is up is the winner of one of the candles. This simple game encourages your guests to flip through the catalog one last time before the end of the party, which just might increase your sales. The best part about this game is that it works for virtually any type of home party business. Before the party, place a special sticker inside one of the product catalogs. At the end of the party, announce to the guests that one of them will win a special prize if they have the catalog with the special sticker inside, and show them what the sticker looks like. Whoever has the catalog with the sticker wins a prize. Prizes can also be great shopping incentives, so consider using some of the products you demonstrate as prizes for your games. If you choose the right items, they'll generate some excitement about your products; this should lead to increased sales and a very successful party that just might bring you more bookings.